Psst! How About a 3D Printed House in 24 Hours? Some things look pretty obvious in retrospect, don’t they? After the Conservative and Unionist Party of the United Kingdom and Northern Ireland hired a known Remainer to be Prime Minister following the June 23, 2016 EU referendum, newly-installed PM Theresa May went about the UK and the world telling all who would listen, that she, Theresa May, HAD THE RIGHT STUFF to take the UK out of the European Union — only to fail to deliver Brexit 31-days short of the finish line on March 29, 2019, the official Brexit date. This disappointing forecast is due to news reports coming in that Theresa May might wish to delay Brexit, although as little as one day ago she said there’s no benefit in delaying Brexit as the same intractable problems would remain after the delay and still require solving — and that British MP’s should ‘Hold their nerve’. Which seems quite logical. If the UK and the EU couldn’t get a decent Withdrawal Agreement done in 2.5+ years, what makes them think they would get it done in 2.8+ years, for example? The same issues will need to be resolved then, as now. We shouldn’t have been fooled. Largely unknown in British politics, Theresa May toiled away in obscurity as the Home Secretary for 6 quiet years. Indeed, Theresa May’s time in the Home Office has come to be known as the quietest time in Home Office history. But while waiting for the PM’s chair to come up, it’s wise, I suppose, to remain uncontroversial. And so much more than that. If you don’t believe me, every significant speech given by Theresa May since July 2016 is published elsewhere at this website and most of those speeches have an accompanying YouTube video so you can see her speak the words herself and read the transcript (provided by the UK government) and decide for yourself if she actually believed what she was saying at the time, or whether she just wanted to continue as Prime Minister long after she realized that she wasn’t up to the (Brexit part of the) job. Had she given it up earlier, Michael Gove or Jacob Rees-Mogg could’ve jumped in to the PM”s job and gotten the UK a decent Brexit deal before the official Brexit date and Theresa May could’ve gone on to the House of Lords, or wherever she had hoped to go, and no one would’ve ever known she couldn’t deliver on her Brexit promises. Or, (he wrote hopefully) maybe this is a bargaining gambit to get the EU off balance — with them realizing they would suddenly be negotiating against a strong Brexiteer like Michael Gove instead of a weak Remainer like Theresa May — consequently, they might seize the opportunity to sign an amended Withdrawal Agreement before Ms. May departs from politics forever. “Oh Luvvie, we miss you already!” lamented every EU bureaucrat. You Were So Close, Theresa, So Close. But if you can’t get it done; If you find you can’t keep your promises, it’s time to step down and let a Brexiteer take up the Brexit mantle — delivering the Brexit that you promised to more than 17.4 million Britons — and to many former Remainers who also want the misery/economic uncertainty to end and are saying things like, “Just get it done!” and “Let’s move past this divisive part of UK history!”. We know you tried your best, but you just came up short. She’s done a great job on the economy. All stats are charting in the right direction. People ‘in work’ are at an all-time high. Unemployment is at an all-time low. The NHS has recently had its best showing in The Commonwealth Fund’s rigorous healthcare outcomes rankings (#1 out of the top 11 healthcare systems in the world) People seem more fulfilled and are living longer in the UK. And government departments seem more efficient and relevant to UK citizens (and to bloggers looking for information, quotes, or charts) So it wasn’t all bad. In retrospect, Theresa May did a great job on the economy and in other ways too. Perhaps Brexit is her nemesis. What to Do for the Next 31 Days? Assuming Theresa May isn’t using some arcane negotiating trick against the EU to get a deal before the March 29, 2019 deadline (which could be a thing, I suppose) every Brexiteer in the world will be counting backwards from £100-billion — because that’s about how costly the past 2.5 years, plus the proposed negotiating extension period will harm the UK economy due to the economic uncertainty attached to the outrageously long Withdrawal Agreement negotiating period. Are politicians becoming irrelevant in the 21st-century? If you’re judging them by their failure to create a legally binding Brexit Withdrawal Agreement that can be ratified by the UK and EU27 countries, then, yes, they have (all of them) conspired to make themselves irrelevant over the past 2.5+ years. Because it should’ve been slam-dunk easy to arrange a deal between people who are European partners, NATO allies, and leaders of countries sharing the Western way of life; Freedom, democracy, a capitalist economic model, and so much more! It’s not as if Theresa May is negotiating with the Klingons. There should’ve been a deal, no excuses. So, what is it with these people? Don’t they want to be important? Are they afraid of success? Have they become self-hating politicians seeking to destroy the very system that brought them to power? If we go on facts alone, each of those points has some amount of merit attached to them. But it just doesn’t feel right to attribute those things to those politicians. Which means something else is going on. So, no point in doing that. Has anyone checked on yellow vest sales in the UK and EU27 countries lately? Could hundreds of millions of yellow vests be ‘on order’ for people to wear in the event of a ‘No Deal’ Brexit caused by their incompetent politicians? Any reports on UK and EU27 countries buying-up water cannons by the dozen from third-world dictatorships? Because I would expect all that and more to become true in the case of a ‘No Deal’ Brexit — a political failure with no good reason other than misplaced pride on one side and hurt feelings on the other. C’mon people, we’ve got to be bigger than this! In EU28 countries famous for street riots (that would be all of them) over a lost soccer match of all things, I can only imagine what kind of riots would occur should Europe’s politicians fail to deliver a decent Withdrawal Agreement to keep the economy going. You know, the industry (jobs) retail stores (jobs) and transportation systems (jobs and consumer convenience) that 500 million Europeans rely on? The End of Democracy in Europe? The once mighty Soviet Union sneered at peaceful citizen protest and look what happened to it. Joe Stalin famously laughed off suggestions that the Church could have any effect on the Soviet Union — a country more powerful than any other in the world except the United States, saying, “How many (military) divisions has the Pope?” and yet it was the Catholic Church that mobilized hundreds of thousands of Poles to peacefully obstruct the USSR in Poland thereby bringing a resounding end to the Soviet Union; A military hyper-power dismantled in weeks. OK, maybe he didn’t say that. Or, maybe he just didn’t have enough time to say it before losing the ability to speak. But that doesn’t make that contrived quote any less true. The People always win. Which is why politicians must always succeed for The People, be seen to be succeeding for The People, and be aware that at all times their power base is The People and only The People. Let’s hope that Europe’s politicians don’t unwittingly create another Gordian Knot (but this time an economic one) that destroys them and everything that made Europe all that it is today, just because they can’t get a simple Brexit Withdrawal Agreement signed by March 29. After all, they’ve had over 2.5+ years to get it done and The People aren’t getting any more patient with their leaders. It’s time to succeed or it’s time to get out of politics and flee the coming riot zone, IMHO. Australia should be far enough, but I offer no guarantees. In the end, let’s hope that the Brexit Withdrawal Agreement delay is about all about an 11th-hour bargaining ploy to get better terms — and life (and democracy in Europe) can continue without whole-scale change interrupting what became the world’s foremost worst-to-first story every day since May 8, 1945. Let us not go backwards ever again. But let us go forward as brethren and allies, and let enduring peace and prosperity be our guide. We must be that, or all of it has been in vain. Q: Why do EU negotiators feel the need to have an Irish Backstop? A: The simple answer is that the EU has one set of tariffs (a tariff regime that’s part of the EU’s Single Market) and it’s expected that the UK would enact their own tariff structure after Brexit (as part of the UK’s modern industrial strategy) that might conflict with the EU’s tariff structure. In Business for the EU or the UK? European Union leaders feel the UK should remain in the Single Market to make life easier for the EU by ensuring that all tariffs are duly collected and remitted to the proper EU department and once you consider the serious budgetary pressures of Brussels-based politicians it’s understandable why they feel that way. The question though is; Should the UK give up some amount of sovereignty (the ability to sign its own trade deals) so that another country or bloc can ease their budgetary pressures? What kind of logic is that? The simple answer, of course, is that no countries do that. Ever. The exception is where countries have reciprocal free trade deals with each other. In the NAFTA countries (NAFTA remains in force until USMCA supersedes it) those countries collect and remit tariffs, levies, and fees on behalf of the others all the time, and nobody thinks a thing about it because it’s just normal business. That’s what valued trading partners do for each other. See the problem here? The UK and the EU need a reciprocal free trade deal to solve any remaining Brexit issues — and more importantly — to prevent future problems in the relationship. The UK and the EU have taken each other for granted for so long, that both sides think that taking each other for granted should remain the default mode even after Brexit. Which is completely unreasonable — and such liberty-taking will eventually result in messy, unpredictable, and ultimately, disastrous results for business on both sides. Living in each other’s back pocket since 1973 has been fun, hasn’t it? (Depends upon whom you ask, but for a time there were benefits for both sides) But that part of the relationship has ended and it’s time to create an honest relationship, one based on mutual respect, formal lines of communication, and healthy self-interest. Waiting and hoping isn’t going to get the job done, nor is each side trying to out-bluff the other going to get the job done, as we’ve seen over the past 2 1/2 years. Someone needs to grab the bull by the horns now before the official Brexit date of March 29, 2019 and do what needs to be done. Playing the eternal political blame-game as each side waits for political support in the other country to collapse isn’t what clear vision and leadership excellence is all about. So, instead of defaulting to the failed Us vs. Them problem solving modality of the 20th-century, today’s leaders must move boldly towards a Win-Win problem solving modality, especially between Europeans sharing a hemisphere and as fellow NATO allies. And there’s no excuse good enough to do otherwise. When you begin with a clear vision and add great leadership to carry out that vision, the results can only be good. Europe’s people on both sides of the English Channel deserve that good/better/best future! How Many Days Until Brexit? Click the image to view the latest How Many Days Until Brexit? statistic. With less than 50-days until the official Brexit date of March 29, 2019, no Withdrawal Agreement exists to guide future relations between the UK and the EU. Although no reference to a such a withdrawal agreement appeared on the 2016 referendum ballot it seemed appropriate that UK and EU governments should attempt to create such a legal document in order to facilitate a better future relationship. Subsequently, the two governments agreed to create a ‘Withdrawal Agreement’ (WA) document and try to have it ratified by their respective houses of Parliament. And while the EU27 hasn’t tried to ratify the agreement, UK Prime Minister Theresa May offered it up for consideration in the House of Commons where it was voted down by a margin of 230 votes in one of the largest defeats in the history of the United Kingdom. The 585-page Withdrawal Agreement was diligently prepared by Theresa May and her Ministers and there’s no doubt that the EU side also worked ceaselessly to produce it, yet British MP’s were singularly unimpressed by the ‘backstop’ clause dealing with the Irish border. That particular section of the agreement is 175-pages long, plus 10-pages of addenda. Yikes! In any event, all parties in the House of Commons voted it down handing in the worst defeat for a governing party in the House in 100-years, thereby stalling further progress on Brexit negotiations. So, if you arrived here looking for the reason why no agreement exists to guide Brexit with less than 50-days until the official Brexit date, you’ve found it. The Irish Backstop portion of the WA (185-pages in total) is solely responsible for the lack of a Withdrawal Agreement between the UK and the EU. But the remaining 400-pages would pass in the UK House of Commons in minutes — and would easily pass in all of the EU27 countries too. There’s simply no dispute in the WA, except for the portion that deals with ‘the Irish backstop’. As ‘the Irish Backstop’ has Failed, What Alternatives Exist? Until last week, everyone involved in Brexit negotiations was locked-on to the idea of getting the Withdrawal Agreement passed through the House of Commons and then getting it passed in the EU27 parliaments. And now that it has failed so massively, we are compelled to seek other options and such options to resolve the Irish backstop issue are only limited by our creativity. The territory of Northern Ireland was created a couple of centuries ago when the ruling Monarch of Great Britain purchased the territory and it thenceforth became part of Great Britain. Therefore, Northern Ireland could be sold or granted to the Republic of Ireland by the owner of NI which would be today’s Monarch of the United Kingdom of Great Britain and Northern Ireland (thereby obviating the need for ‘the Irish Backstop’ and guaranteeing near-instant passage of the Withdrawal Agreement) who would only do so if a majority of Northern Ireland’s people expressed their wish to join with the Republic of Ireland. Which would make for an interesting Northern Ireland-only referendum question, wouldn’t it? Assuming The People of Northern Ireland voted to leave the United Kingdom of Great Britain and Northern Ireland, the ruling Monarch would be well advised to accede to their wishes and let them leave. One important caveat must be in place, namely, that any property and historical buildings, monuments, etc., would need to be disassembled and returned to Great Britain as they are the property of the UK and from a pragmatic standpoint I doubt that statues of Sir Winston Churchill etc., would remain standing for long in a Northern Ireland that would join with the Republic of Ireland. Even the Stormont building in NI could be removed ‘brick-by-brick’ and relocated to Great Britain. If Northern Irelanders voted to leave the Kingdom, no doubt some would want to relocate to Great Britain to maintain their UK citizenship and their relocation to the UK should be facilitated with greatest care, speed, and respect, should that particular set of events ever occur. However, if The People of Northern Ireland voted in a referendum to stay in the United Kingdom of Great Britain and Northern Ireland, the ruling UK Monarch and the UK government are obligated to accede to the wishes of Northern Irelanders and continue to support their full rights of UK citizenship and devolved governance in NI. 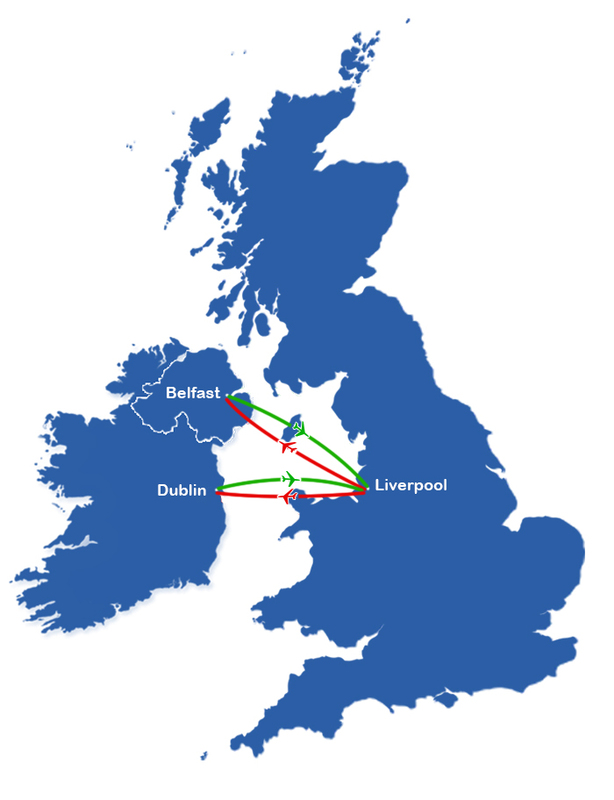 Another way around the present impasse would be for all trade between Northern Ireland and the Republic of Ireland to be routed through Liverpool for customs and inspection — by air or ship — instead of having a so-called ‘Hard Border’ between the two Irelands. Items valued under £100. (or some other mutually agreed and arbitrary number) could be exempted so that shoppers crossing the border between ROI and NI by car could purchase small items, etc., without incurring any tax liability or having to pass through a hard border crossing. Unlike every other country in the world, a hard border just isn’t acceptable due to the decades of conflict caused by poor leadership and oversight in the UK and in the Republic of Ireland that led to a horrible, divisive, and toxic power vacuum which led and fed the conflict. Let’s hope that politicians, corporations, and royalty in the 21st-century don’t drop the ball like that again. Ever. And I hope that every one of them that dropped the ball are roasting in Hell to this very day, paying for the fecklessness that caused such misery to hundreds of thousands of people on the island of Eire. Less than 50 days to go until the official Brexit date of March 29, 2019 and still no solution to the Irish backstop issue. Assuming goodwill on both sides, a deal will be done. Another suggestion is for new technologies exist that could be used to track and collect tariffs/maintain safety certifications, etc. on goods sold between the Republic of Ireland and Northern Ireland, and between other EU countries and Northern Ireland, and between overseas countries and Northern Ireland — and I believe it’s possible. The amount of information that can be contained in one bar code (a simple bar code!) is astounding. All that needs happen is for each such item to be scanned by a bar code reader. I can only imagine what modern and more sophisticated technologies could accomplish. Perhaps cooperation between the UK and the EU on these new technologies would result in the same scale of technological revolution as the introduction of the bar code and both countries could lead the world in such technologies. Wouldn’t that be great? In short, if UK and EU leaders want to find a way forward they will and if they don’t find a way forward it’s only because they don’t value success. IMHO, there’s no reason that political power vacuums should be allowed to occur in the 21st-century. Such power vacuums have proved disastrous in the past. So, let’s decide now to choose that better path, whatever it may look like. It isn’t the job of citizens, of corporations, of sports teams, nor of any other organization to solve the political problems between or within developed nations, it’s the remit of politicians to solve political problems, therefore, let’s go forward with those sentiments in mind and together, write a much better script for our respective peoples so that everyone gets to live in peace and prosperity. Erwin Rommel, one of the most brilliant (and vastly underrated) military officers in history famously said; “Don’t fight a battle if you gain nothing by winning,” and Britons must be reminded of this here for it shows the astonishing difference between the military mindset and the civilian mindset. If any Gibraltans don’t want to become Spanish citizens after Brexit they are welcome to sell their homes in Gibraltar and up-stakes to Britain, Northern Ireland or any of the British territories in the Caribbean, for example. I’m sure EU citizens would be happy to purchase those homes at a premium, so there won’t be any financial losses to Gibraltans.